— Two Russian cosmonauts and a U.S. astronaut are now on their way to the International Space Station, where they will begin the outpost's 50th expedition a week after they arrive. Cosmonauts Sergey Ryzhikov and Andrei Borisenko and astronaut Shane Kimbrough lifted off Wednesday (Oct. 19) on board Russia's Soyuz MS-02 spacecraft on a two-day rendezvous with the station. 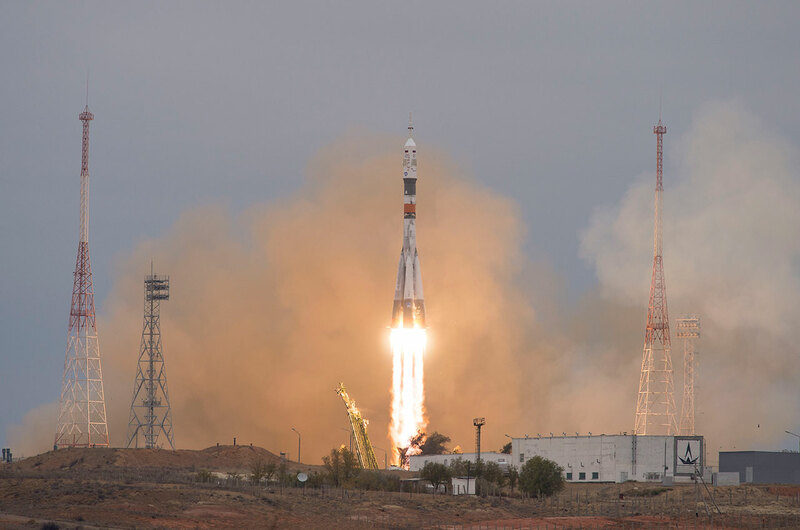 Their launch at 4:05 a.m. EDT (0805 GMT; 2:05 p.m. local time) came atop a Soyuz FG rocket from Site 31/6 at Russia's Baikonur Cosmodrome in Kazakhstan. 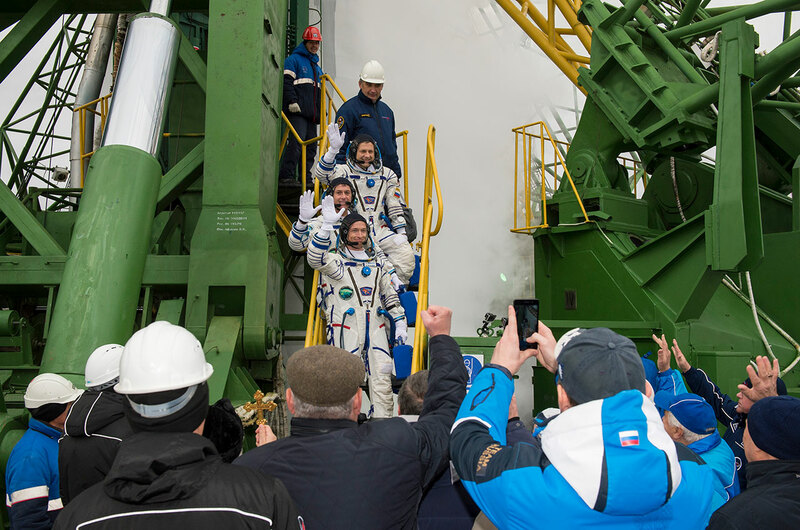 The crew reached orbit nine minutes later, signaled by a "zero-g indicator" in the shape of Russia's next generation crew spacecraft "Federatsiya," which is planned to replace the Soyuz by 2023. 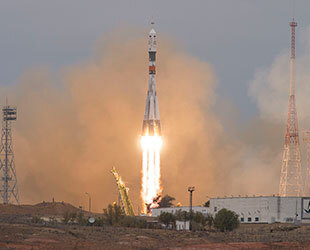 Wednesday's launch, which had been scheduled for Sept. 23, was delayed after a faulty cable was discovered during pre-flight tests inside the Soyuz descent module's control system. The cable was replaced, but the delay shortened the crew's planned stay aboard the space station from five months to a little more than four. 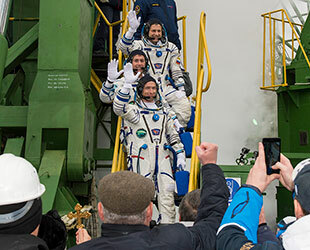 The postponed launch also limited the time that Ryzhikov, Borisenko and Kimbrough will serve as Expedition 49 crew mates with cosmonaut Anatoli Ivanishin, NASA astronaut Kate Rubins and Takuya Onishi of the Japan Aerospace Exploration Agency (JAXA), who have been on board the space station since July and are set to return to Earth just before midnight (EDT) on Oct. 29. "The short hand-over time we are going to have with the previous crew is unfortunate for us," said Kimbrough in a pre-flight press conference on Tuesday, "because we were really looking forward to spending almost two months with them. But now it is just a week and we're going to have a great week with them. We're going to learn as much as we can from them in that week and soak up all the knowledge they can send our way so that we can be more efficient once they leave." Ivanishin will hand over control of the station to Kimbrough on Oct. 28, during a change-of-command ceremony. The departure of the Soyuz MS-01 crew the next day will mark the start of Expedition 50. 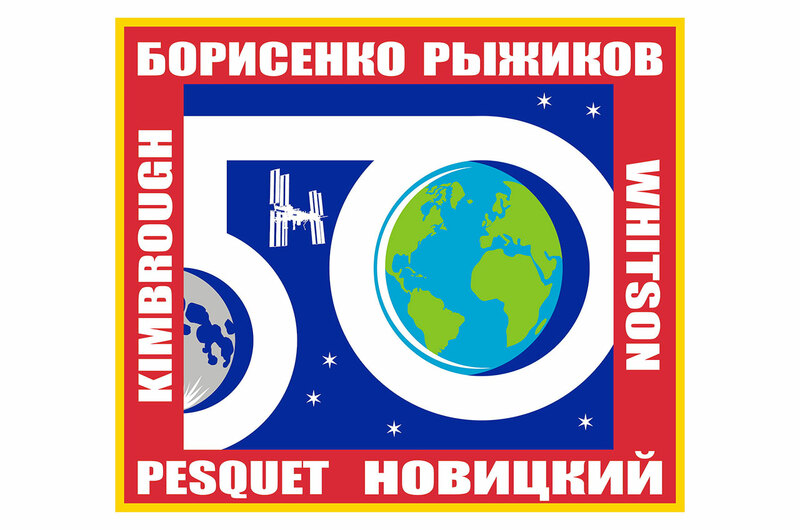 "That is pretty significant, for it to be the 50th time we've sent a crew to the International Space Station — kind of a really remote outpost, is pretty significant, in my mind, so I hope we do it justice," said Kimbrough in an interview with collectSPACE. "We just happen to be the crew." 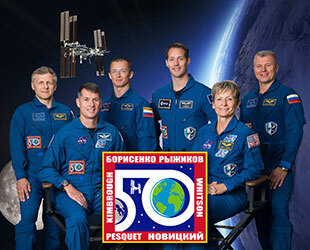 The crew's expedition patch features a large, stylized "50" with the numerals wrapping around representations of the Earth and the moon. 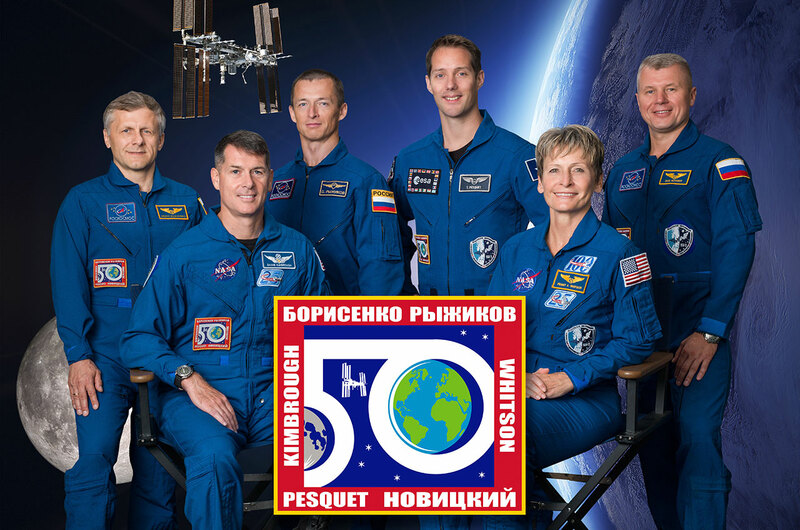 Expedition 50 will grow to six members when Roscosmos cosmonaut Oleg Novitskiy, astronaut Peggy Whitson and Thomas Pesquet with the European Space Agency (ESA) arrive on Soyuz MS-03 on Nov. 16. 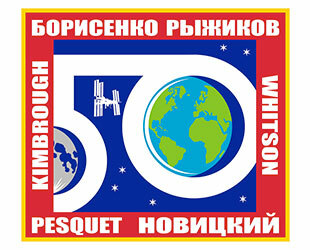 Kimbrough, Ryzhikov and Borisenko will be busy almost immediately upon arriving at the space station Friday (Oct. 21). Two days after they dock, Orbital ATK's Cygnus cargo spacecraft will berth at the orbital complex, bringing more than 5,000 pounds (2,300 kg) of supplies and equipment for Expedition 50. The Russian supply ship Progress MS-04 will then dock in early December. JAXA's H-II Transfer Vehicle (HTV) "Kounotori 6" is scheduled to arrive by the middle of the month. Another Orbital ATK Cygnus is scheduled to resupply the station in early January, followed by another Progress in early February. SpaceX may also launch a Dragon cargo vehicle to the space station, pending its Falcon 9 rocket's return to flight after a launch pad failure in September. Kimbrough, Ryzhikov and Borisenko will also work on the hundreds of experiments underway on the space station, as will begin new investigations into the behavior of fire in space, the effects of lighting on astronauts' health and the physics, nature and dynamics of neutron stars. Kimbrough may also conduct one, if not two, spacewalks, in part to replace batteries for the station's solar arrays. 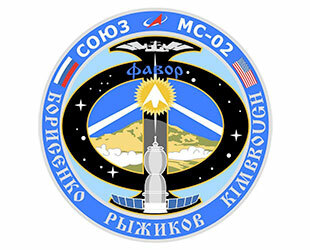 The Soyuz MS-02 launch marked the start of Borisenko's and Kimbrough's second spaceflight. Borisenko, 52, logged 164 days on board the space station as an Expedition 27 flight engineer and the commander of Expedition 28 in 2011. Kimbrough, 49, first visited the space station as a mission specialist on space shuttle Endeavour's STS-126 mission in 2008, logging almost 16 days in orbit. Ryzhikov, 42, is making his first flight as the commander of the Soyuz MS-02 mission. The three crewmates are slated to return to Earth aboard Soyuz MS-02 on Feb. 25, 2017. 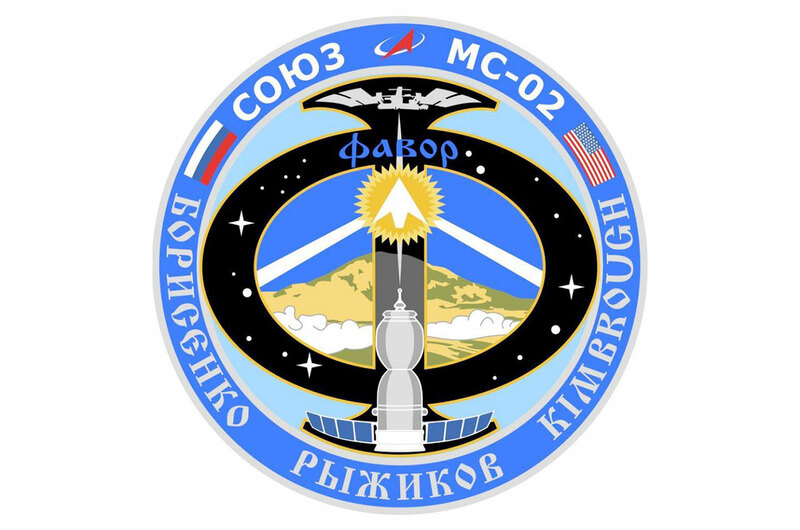 Soyuz MS-02 is the 48th Soyuz to fly to the International Space Station and the 131st to launch since the first flight of Russia's Soyuz-class of spacecraft in 1967. Click here to enlarge and view the video in new, pop-up window.